At Ayr on Saturday 13th April at 15:35 it is the Scottish Grand National Handicap Chase run over a distance of about 4 miles (3 miles 7 furlongs and 176 yards, or 6,397 metres) and during its running there are 27 fences to be jumped. It is a handicap race, and takes place each year in April. It is Scotland’s equivalent of the Grand National. First run in 1858 near Houston in Renfrewshire the course consisted of 32 jumps, mainly stone walls. In 1867 the race moved to Bogside Racecourse, near Irvine. During the early years the race’s distance was about three miles. It was later extended to 3 miles and 7 furlongs, and became known by its present name in 1880, when it was won by Peacock. After Bogside Racecourse closed in 1965 the Scottish Grand National was transferred to Ayr for the 1966 renewal. At this point the race was increased to its present length. 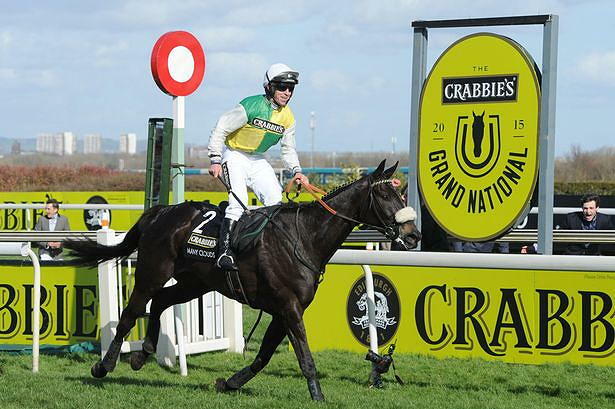 Several winners of the Scottish Grand National have also won its English counterpart at Aintree. The first to complete the double was Music Hall, the winner of the 1922 Grand National. The feat has been achieved more recently by Little Polveir and Earth Summit, but the only horse to win both races in the same year was Red Rum. In 1974 when Red Rum achieved that famous double there was three weeks between the Grand National at Aintree and the Scottish Grand National which gave horses plenty of time to recover between races but in more recent years when they are a mere week apart it is very rare for a horse to run in both races. Age – All of the last 12 winners were aged between 7 and 11. Starting Price – Bad race for favourites with only 1 of the last 12 winning, 9 of the last 12 winners went off at a starting price of at least 12/1. Weights – 8 of the last 12 winners carried between 10st & 11st 3lbs. Last Run – Just 3 of the last 12 winners won on their last run before the Scottish Grand National, 11 of the last 12 winners ran within the last 43 days. Course Form – 4 of the last 12 winners had at least 1 previous run at Ayr, 3 of them had at least 1 previous win at Ayr. Distance Form – 9 of the last 12 winners had at least 7 previous runs over 3 miles or further and at least 2 previous wins over 3 miles plus. Chase Form – 9 of the last 12 winners had at least 7 previous chase runs and at least 2 previous chase wins. Official Rating – 10 of the 12 winners has an official rating of between 133 and 146. Graded Wins – 4of the last 12 winners had at least 1 previous win in a grade 1-3 race. Current Season Form – 10 of the last 12 winners had at least 4 runs in the current season, 9 of the last 12 winners had at least 1 win in the current season. DINGO DOLLAR (8.1) – Market leader at time of writing, placed at Ayr as a novice but has never tried a marathon trip like this. BIG RIVER (9/1) – Course winner, fourth behind both Beware The Bear and Vintage Clouds at Cheltenham, well in at the weights but would need more rain. VINTAGE CLOUDS (12/1) – Overreached at the first fence and fell in last week’s Grand National but thankfully has come away from that experience unscathed. 3rd in this race last year and was second behind Beware The Bear in the Ultima at Cheltenham on penultimate start, gets a 3lb pull with that rival for 1 1/4 lengths, stays forever and jumps well. BEWARE THE BEAR (12/1) – Won the Ultima Handicap Chase at the Cheltenham Festival, has gone up 9lbs in the weights, pulled up in this last year when rated 11lb lower. My selection for the race is VINTAGE CLOUDS 12/1 Each Way it was very upsetting to see him fall in last week’s Grand National and thankfully he is none the worse for what happened, trainer Sue Smith and husband Harvey wouldn’t risk running him if he wasn’t fully fit, with a clear round we will get back the money we leant the bookmakers last week. The Scottish Grand National is just one of 9 ITV races on Saturday that members of our Premium Tips service will receive tips for, the races include quality Flat racing from Newbury as well as the jumps card from Ayr.